Plastic healthcare packaging refers to the packaging of the devices, drugs and other healthcare products in a secured manner. Packaging is one of the major industries in the world in which the healthcare packaging represents a smaller share. The pharmaceutical packaging has become the important part of the drug delivery system as well as the major component of the marketing mix, which helps to distinguish the product from one competitor to another. Healthcare packaging helps to protect the product from the materialistic damage, biological contamination and other unfavorable external influences that can interfere with the properties of the product and makes it unsuitable for the use. Healthcare packaging can further be bifurcated into the primary packaging, secondary packaging and tertiary packaging. Primary packaging includes cap, labels, bottles, cap liner and others such as blisters, tubes, syringes and inhalers. Secondary packaging consists of corrugated shippers, pallets and cartoons. This packaging aims to provide additional packaging to the product and helps to make the product suitable for the transportation use. Patients have directly benefitted from plastic packaging which is provided to the healthcare products. The anti-microbial plastic has been created and used in the healthcare product that reduces the risks of infection to the patients. The use of safety measures designed into the plastic components has led to a significant impact on increased safety of patients. For example, virtually all pharmaceutical packaging has tamper proof measures such as blister caps and childproof caps. Additionally the plastics do not shatter, which makes it generally safer than the glass for transport or storage of hazardous materials and specimens. Plastics also effectively preserve the integrity of other materials, by the use of protective coatings. Further, the plastics have helped to reduce the medical costs, for the medical providers and the reduction in costs are sometimes passed to the consumers. The global healthcare packaging market is expected to grow at a CAGR of over 7% over the forecast period i.e. 2017-2024. The growth of the market is attributed to the recent increase in the usage of disposable medical products. A large number of the healthcare products used in the modern healthcare facilities such as needles, pre-filled syringes and trays are available as the disposable products. The growth of the market is primarily driven by the rising adoption of plastic in healthcare product due to the ease offered by them in disposing of the products when they are consumed. Growing use of plastic in healthcare packaging is mainly attributed to the innovation in the use of making plastics. The combination of plastic technology and use of sensors and other smart equipment in healthcare packaging is expected to boost the overall safety and security of medicines, vaccines, syringes, etc. In addition, the macro-economic trend, the packaging industry is moving to the next generation, with smart sensors and real time tracking paving the way for the adoption of advanced plastic packaging solutions. Further, the plastic as a sought after packaging product in healthcare sector is facing an increased demand due to its advantages of being the cost effective and sturdiness. Moreover, the mass production of plastic packaging materials offers substantial cost advantages to the manufacturers, making plastic a preferred material for packaging of syringes and trays. However, the growth of the market is hindered by the increase in counterfeiting practices in the pharmaceutical industry. Asian countries are highly affected by counterfeiting of pharmaceutical products, especially in non-prescribed drugs. Moreover, the healthcare packaging market is constantly challenged by shifting trends such as the increased use of disposable medical products, an ageing population and tamper-evident packaging. 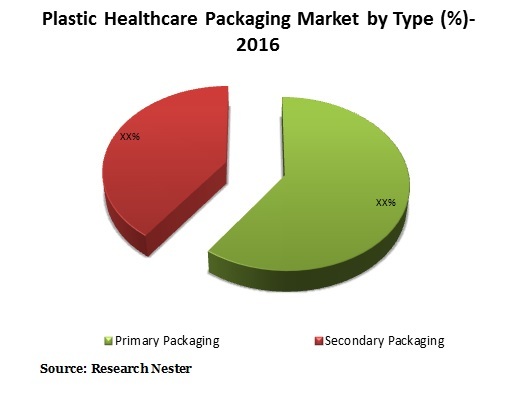 Geographically, North America is the largest market for plastic packaging in the healthcare sector, followed by Asia Pacific. The growth in the region is driven by the presence of health-conscious people and their spending power. Strong innovation, rising aging population and inclining consumer demand towards the sophisticated packaging is likely to boost the growth of the healthcare packaging in North American region. The growth of the healthcare packaging in Asia- Pacific, particularly the economies of India and China has emerged as the hub of the medical tourism, fueled by strong investment in healthcare sector. Moreover, the Latin America is expected to offer growth opportunities to key players in healthcare plastic packaging market in the coming few years. Brazil is evolving as a lucrative healthcare center in Latin America, and it is expected that in future, the healthcare plastic packaging sector will witness favorable growth rates.